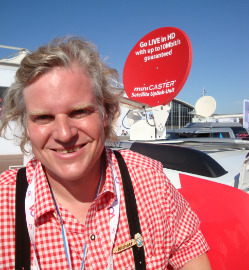 Michael Westphal: Ka-band satellite uplink-miniCASTER. Michael Westphal, CEO of miniCASTER, is certain of one thing: Ka-band newsgathering is destined for rapid growth. “People are surprised by the low cost and they can't believe the video quality. It's the same quality [as Ku-band],” said Michael. Michael has been in the live streaming business for more than 15 years. His company in Germany produces the miniCASTER encoding unit which can be attached to a camera and is used for live streaming across IP networks such as 3G. 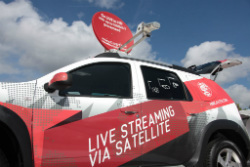 But he is now launching a mobile satellite uplinking system aimed at broadcasters and webcasters. Charging is done by data volume. 1Gb is approximately 45 Euros giving about two hours transmission time using 1Mbit/s bandwidth.